This is just a placeholder to make it clear that there will be no meetup for July due to the 4th of July. We plant to resume meetups on August 2nd. No agenda, no expectations, no fee - just come and hang out with other #ladydevs to work on a project. Whatever has got you stuck, bring it and we'll talk it over to see if two heads can solve the problem. KCWiT mentor Tamara Copple hosts. July 13: Interface Tour KC 2017 at OPCC - Security! Interface KC is July 13th, its FREE, and will be at the OP Convention Center: This year's free event is extra special because we have an opportunity to raise funds for our chapter when you sign up through this link: http://www.interfacetour.com/evites/kcm/isc2-kcm.htm We will have a table, volunteers welcome. Please register for the next (ISC)² Kansas City Chapter Meeting and plan to attend the first Wednesday of the month-July 5th! Registering will help us plan accordingly for meeting space, chairs and refreshments. We have three great panelist coming to share insight on how to find and keep security talent. They will also discuss how you can make your own smart transition. Carol Hull (MIC Intern coordinator at University of Central Missouri), Emily Briseno (Account Manager for Information Security Services at TEKSystems), and Stacy Plack (CSO at Silver Arrow Technologies, LLC) bring their unique perspectives in hiring talent at all levels of experience. New User Group in Kansas City - "Kansas City Java Users Group"
The Kansas City Java User Group is a group dedicated to teaching and learning more about the JVM. July 4: KCDesignCore | Adobe Visual Design Community - NO MEETING IN JULY! Due to its proximity to Independence Day, we always cancel the July meeting. We will resume in August on a NEW MEETING NIGHT: the FIRST MONDAY OF THE MONTH (previously we met on the first Tuesday; we are moving our monthly cadence back by one day). More information to come, but for now, feel free to delete the recurring meeting date(s) from your calendar and prepare to update them! Lawrence Tableau users, newcomers and enthusiasts meet to discuss Tableau and work on projects. Digital Summit is where ideas and inspiration are born. Join your peers for a jam packed two days with digital marketing best practices, latest trends and strategy. 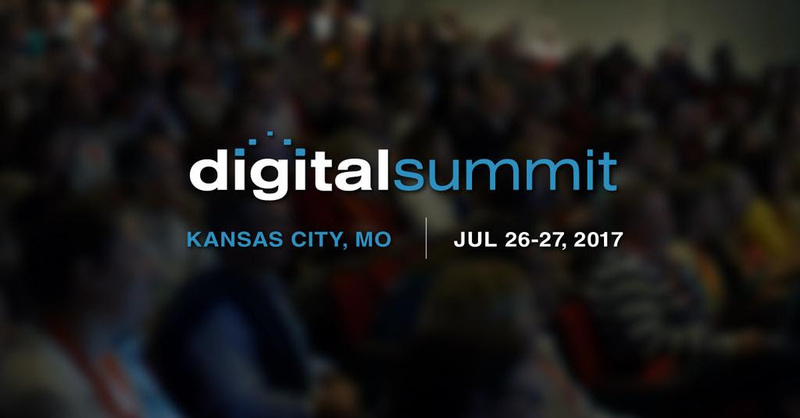 Use code SMCKC for $50 off any conference category PLUS register for our July breakfast and be entered to win a conference pass! July 7 | 7:30 a.m.
Over the years, Kansas City's Charlie Hustle has partnered with several local nonprofits to help raise awareness and funds for their specific cause. During these month-long campaigns, organizations are selling an experience much deeper than just a t-shirt. Special thank you to our official SMCKC breakfast sponsor Grand Street. We love you guys! We will offer a lesson on using data structures in Python at this meetup. Coffee and Doughnuts will be provided. Alex Lende is a software engineer at Cerner who creates 3D data visualizations with web technologies including WebGL. He will talk about the state of WebGL in Elm and walk through a few examples to get you the basics of creating a WebGL animation with Elm. Save your brain cells for solving challenging technical problems and support emerging juiceries in KC! Thanks, and see you there. June 28: KCVR - Geeks and Treats Final meeting, and other VR/AR Stuffs. The event is hosted by Murray Arenson, CEO of Pluribus Capital and Managing Director of ConnectNow. ConnectNow is a leading access to capital program from Innovation Pavilion, in partnership with TiE Rockies and Pluribus Capital. About the Presenter: David Gold is a Managing Director at Access Venture Partners. He earned a Bachelor of Science degree in Mechanical Engineering with Special Honors from the University of Colorado and was a National Science Foundation Fellow while earning Masters Degrees in both Aerospace Engineering and Technology Policy from M.I.T. After working as an engineer with NASA, David spent a short time working on Capitol Hill and served in the Executive Office of the President of the United States where he was responsible for oversight of the U.S. Land Remote Sensing and Weather Satellite programs as well as the National Institute of Standards and Technology. David is also the Founder and Chairman of the Colorado Venture Summit, a mentor with the Mergelane and Boomtown Accelerators and a VC in Residence with the Rocky Mountain Innosphere. You can also view by Facebook LIVE at the Innovation Pavilion's Facebook page-just tune in at 2:00 pm CST. Our mission is to advance the development of AI, Machine Learning, Data Science and Deep Learning in Kansas City through education, out reach and collaboration. Join our Meetup here: https://www.meetup.com/kansascitymachinelearning/ or visit our website www.kansascitymachinelearning.com. June's Ruby Luncheon will be taking place at Blue Koi in Leawood. The dumplings are epic. Eric Gruber will be presenting on "Give it a REST! Learn to use Drupal 8's web services modules". Bots, Bots, Bots! Everyone is talking bots. What is a bot? What is the Microsoft Bot Framework? What could bots solve for me? How do I get started? These questions and more will be answered in this engaging and fun session! John loves making users happy and has a passion for creating great experiences for them. Currently the CTO for AJi, he's also had the honor of being a Microsoft Regional Director for the last 18 years. Client-centric, UX-focused software architecture and development thought leader, consultant, trainer, published author and speaker, John keeps an unwavering focus on solving business challenges through the thoughtful use of technology. We all say we love digging into data, but when traffic tanks and our clients are breathing down our necks for answers, we'd rather just have an easy button. The bad news is there is no easy button to offer; digging into data can be an involved process. The good news is it's not nearly as difficult and mysterious as one might think. Take Sherlock for example. While it seems as if he's magically exchanging an overwhelming intake of information for real insights, he's merely taking a linear and logical approach with abductive reasoning (albeit at a speed that almost seems fictional). This presentation will not only touch on some of the core principles and theory of data analysis; I'll be diving in the weeds with tactical tips you can use immediately. Tylor has been doing SEO for the better part of a decade. In 2014, he joined Intouch Solutions, where he is now the Sr. Manager of Search Strategy who he gives strategic support to teammates and clients in the areas of SEO, analytics, content strategy and UX. He also runs a website called SandboxSEO.com so he can occasionally break stuff without making anyone angry. KCSEM events are beneficial for networking with others as well as learning the the ins and outs of online advertising, SEO, PPC, Social Media, Link-building, etc. We hope to see you June 27th, 2017 at Tomfooleries on the Plaza! A $5-$10 recommended donation is greatly appreciated to assist with future events for our group. Git's application is overwhelmingly for programming, but how does it stand up for other handling other projects? Novels, sheet music, chess games, they can all be tracked with source control. How does git hold up in application with them? Is it useful? How might diffs, logs, and commits change outside git's intended application? This talk explores my experiences in using git for novel writing, and looks at the hows and whys of what makes git useful for managing any project--including how to customize git to work with files it handles poorly out-of-the-box, like images. Tentative schedule... we will just roll from one thing to the next but tentatively should lay out like this, this will be a loose meetup so suggest more content and things are subject to change base on feedback.